If you are a savvy shopper, keeping a house looking current and stylish can be a simple matter of keeping your eyes open while zooming through Target or getting sucked into the dish or pillow aisles at TJ Maxx. At least, that works for interiors. Exteriors are bit more challenging to overhaul with just a simple wreath or a newly filled pot of pansies. Let's say your curb could use some more appeal. The first impression your home makes is "I'm tired" or "I'm old" or "My homeowners have been a little busy." Whether you are thinking about putting your house on the market or just want to spruce up your home for the holidays, this tour of homes will inspire you to improve your home's first impression. Entries are composed of more than just a door! Each element adds another layer of detail, authenticity, color, texture, or shape to this critical area of your home. 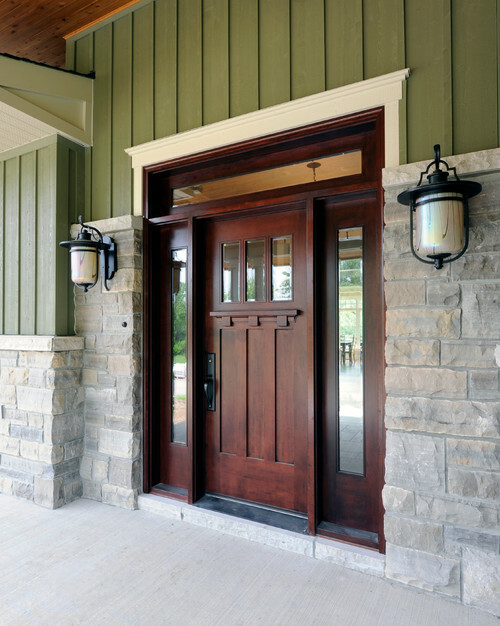 Hardware, coach lights, and even address numbers all impact what your doorway looks like and what effect is has on your guests. This door serves as bold balancing act between the dramatic vertical siding, stone accents, and the oversized coach lights. The craftsman style doorway with sidelights in gorgeous stained wood strikes the right notes of secure, solid, beautiful, and welcoming. Perhaps you prefer a more traditional look? 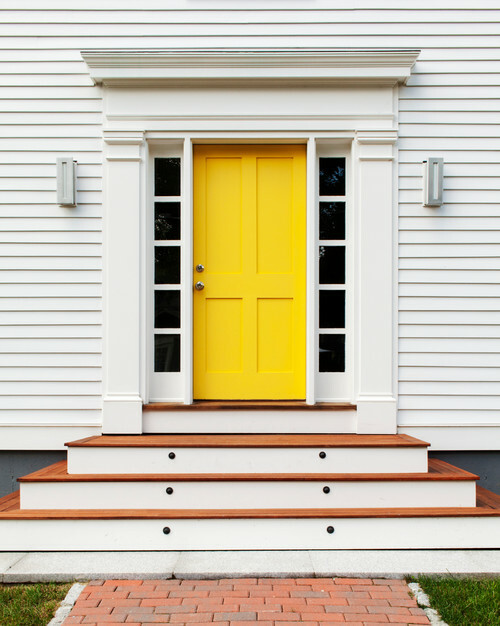 This traditional doorway complete with pediment and pilasters goes modern with the sleek coach lights, sunshine yellow door, and whimsical stair detailing. An old, unmaintained, or undersized porch can act just like a dingy hallway - an unremarkable way to get from point A to point B. However, a porch remodel can look at such a porch and see a blank canvas. Should you replace your round columns with square columns? Should you bring in a new rail design? Put down new decking or flooring on your porch or patio? Fix your stairs? The overall impact will be outsized for the square footage you remodel. 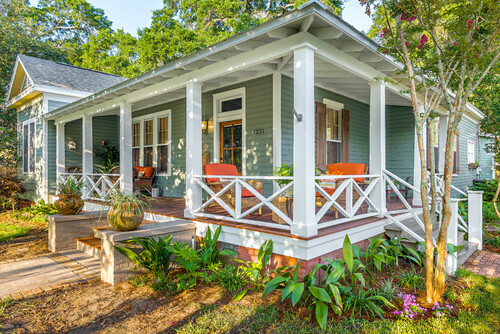 This porch uses a simple rail design, reminiscent of farmhouse fencing, new decking and colorful furniture to make it a perfect place to chat, sit, or, in Southern, "set awhile." This design goes in a different direction by eliminating the railing to create an open feel, the ultimate welcome into your home. The metal roof adds another layer of customization to the project. Take your other improvements to the next level and knock out a regular maintenance item at the same time! Although finding the right palette can feel challenging (even overwhelming), the search is worth your while. 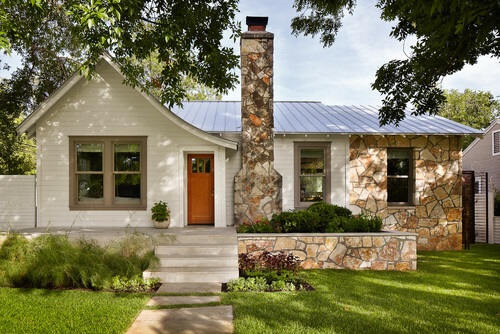 This home is the perfect example of how well-chosen paint colors can take a run-of the mill Tudor style home and turn it into a charming bungalow with an updated look. 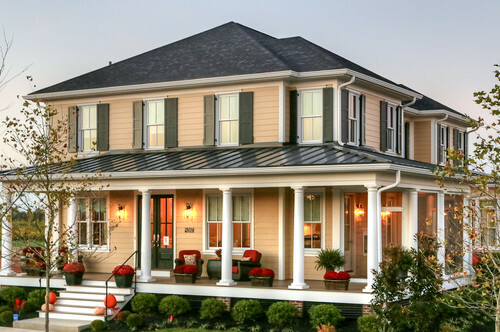 The light siding color is complemented by the earth tone trim and stone work. What pulls the whole look together? That door - the tawny orangey colored door that echoes the stone without overpowering the whole facade. Big improvement with a well directed paintbrush. With the bones of your exterior in order, that wreath that just got clearanced at TJ Maxx might be just the ticket, along with the irresistible seasonal blooms at Home Depot for adding on the finishing touches to your new look. . . your first impression. Have a project in mind? We'd love to hear from you! Two Curb Appeal Projects by Benjamin Andrew Construction.